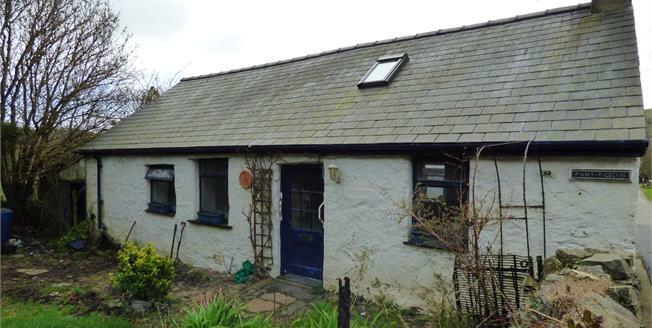 A centuries old detached character cottage in a delightful garden in rural Llaniestyn. Llaniestyn is a pleasant rural hamlet nestled in a valley in the heart of the Llyn Peninsula. There are no amenities within the village, the nearest being in Sarn Meyllteryn which offers a general store/ butchers, petrol station/small shop, two pubs and community hall. The other nearby village of Botwnnog has a Primary and Secondary school as well as a doctors surgery. The cottage is now unoccupied and requires a complete scheme of renovation and modernisation offering much potential, with the present layout affording a sitting room with fireplace, a through dining room, kitchen area with Rayburn, bedroom and bathroom. Oil fired central heating is installed with a relatively modern external boiler. Externally there are pretty sheltered cottage style gardens to the front with a boundary bordering onto the roadway and to the rear there is good space for vehicular off road parking with sufficient room for extending, subject to planning permission.